Crooked Lane Books, 9781683316237, 336pp. Recently engaged and deeply ensconced in her third year of surgical residency in Chicago, Emily Hartford gets a shock when she's called home to Freeport, MI, the small town she fled a decade ago after the death of her mother. Her estranged father, the local medical examiner, has had a massive heart attack and Emily is needed urgently to help with his recovery. Not sure what to expect, Emily races home, blowing the only stoplight at the center of town and getting pulled over by her former high school love, now Sheriff, Nick Larson. At the hospital, she finds her father in near total denial of the seriousness of his condition. He insists that the best thing Emily can do to help him is to take on the autopsy of a Senator's teen daughter whose sudden, unexplained death has just rocked the sleepy town. Reluctantly agreeing to help her father and Nick, Emily gets down to work, only to discover that the girl was murdered. The autopsy reminds her of her many hours in the morgue with her father when she was a young teen--a time which inspired her love of medicine. Before she knows it, she's pulled deeper into the case and closer to her father and to Nick--much to the dismay of her big city fiance. 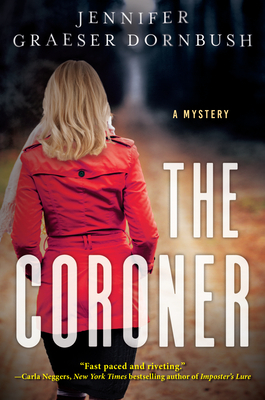 When a threat is made to Emily herself, she must race to catch the killer before he strikes again in The Coroner, expertly written and sharply plotted, perfect for fans of Patricia Cornwell and Julia Spencer Fleming. Jennifer Graeser Dornbush is herself the daughter of a medical examiner, whose office was in her home. She investigated her first fatality, an airplane crash, when she was 10 years old. Since that first case she has had decades of on-site experience in death investigation and 360 hours of forensic training through the Forensic Science Academy. Jennifer now uses these experiences to pen crime fiction for film and TV, with a feature film God Bless the Broken Road slated for release in 2018. She has consulted on shows such as Deception, Hawaii Five-O, Prison Break, Leverage, and more. Jennifer is also member of Sisters in Crime and hosts webinars on crime writing through Writer's Digest.